Ready to make the leap from your old Portfolio site to the brand new PhotoBiz 8? Great! Here’s how to move to the new platform and get started building. 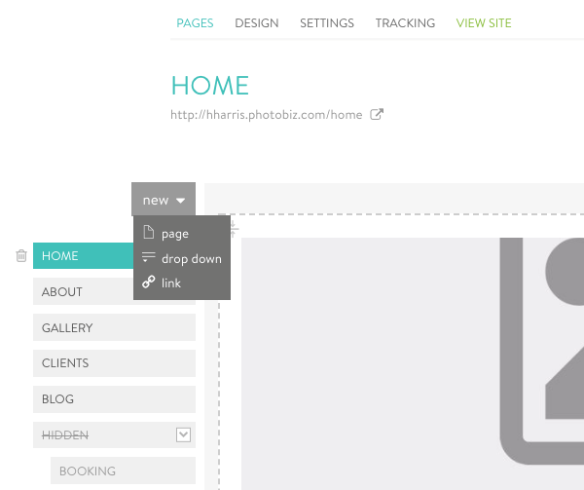 Your PhotoBiz 8 site will now be located in the BUILDER tab of your control panel. Click into your Builder and you’ll notice a green TRY PHOTOBIZ 8 button in the top right corner. Click it to get started! 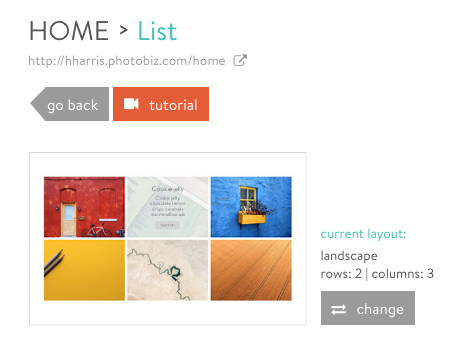 Please note: If you do not see the BUILDER tab at the top of your control panel or the "TRY PHOTOBIZ 8" button once you're in, make sure you have a Blog on your account in addition to the full legacy Builder. Click on the blue GET MORE tab at the top of your control panel to add any missing products or call our Web Consultants for assistance. Start by selecting a template from our template library. There are 20 designs to choose from (with more coming soon! ), and you can change your design anytime. Take a look at the library and preview the samples. 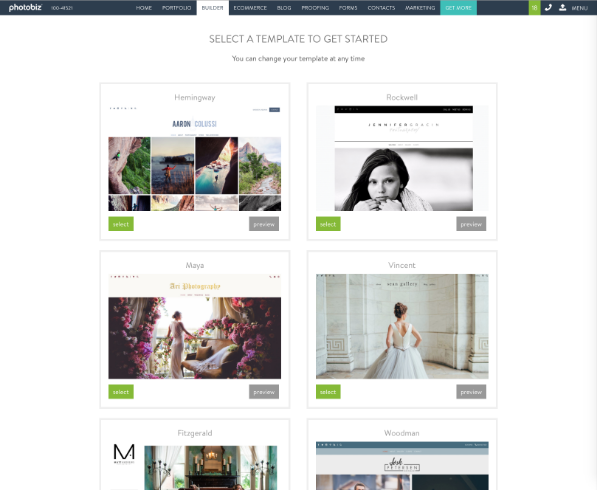 When you select a template to start from, your PhotoBiz 8 builder will load those premade pages and sample content. All you have to do is populate that content and tweak the design until it looks the way you want. Note: Because the new builder is extremely flexible, any template can be customized to get the specific layout that you want. At this point, you’re mainly selecting how you want your menu and logo to be positioned! The PhotoBiz 8 builder is a little different from the Portfolio builder that you’re used to. After you pick your template, click on the TUTORIAL button at the top right of your control panel to get an overview of the functionality. It’s a good idea to get started by experimenting on a new test page. That way you can get used to the new content blocks and options before you start building for real. Create a new page by clicking the gray NEW button and selecting NEW PAGE. You’ll see the content blocks available for you to use on the right-hand side of the window. Click or drag a few blocks from your toolbar and pop them into the middle building area. 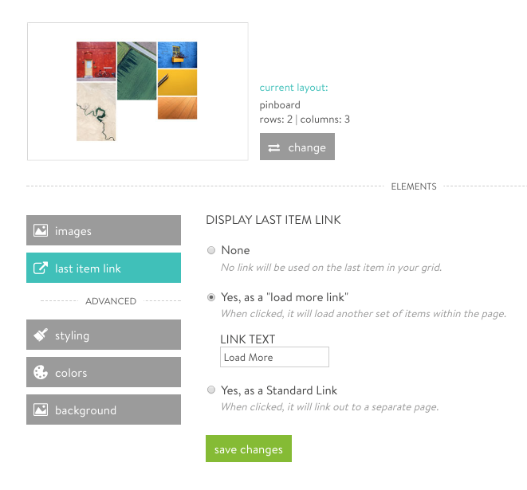 You can click into blocks to add your words and images and customize how you want that section to look. You can change the padding, colors, background, and other things about every block to make it look the way you want. Move your blocks around to change the order. Try adding a BANNER. Experiment with different layouts for IMAGE blocks. Try dragging a text block next to another text block and see what happens. LIST ITEMS are super cool, and you can use them to link images, text, and videos to other areas of your site. You can always click on the orange TUTORIAL button to watch a video or read an article explaining how to use any block. Here's one about how to use a cool new Text + Image block in the builder! PhotoBiz - How To Use Text + Image Blocks from PhotoBiz on Vimeo. Got a handle on how to use the PhotoBiz 8 builder? Great! Now you can start moving your content over to your new site. The best way to do this is to open a second tab or browser window. Set one to your Portfolio, and the other to your new PhotoBiz 8 Builder. Now you can flip between the two windows and copy and paste your words into your new pages quickly. You can use the clipboard to easily transfer over your image galleries. 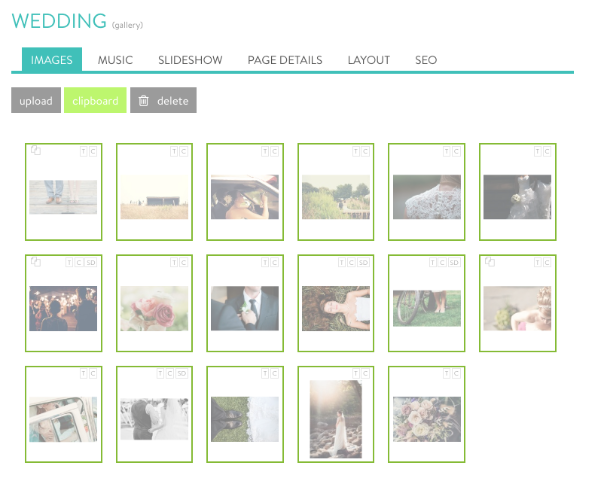 In a Portfolio gallery, simply drag a box around all of your images to select them all. Then drag those selected images to the gray box that says CLIPBOARD. If you have a lot of images, they may be sectioned into pages. You may see little icons that say 1, 2, 3 ... if so, make sure to visit each page to snag your images! Now hop over to your PhotoBiz 8 window. Open an image block and select CLIPBOARD. 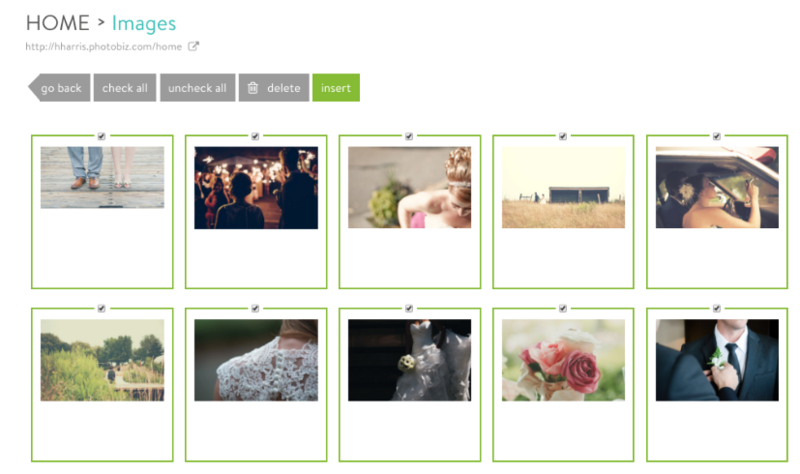 All of your most recent images will be saved there, so you can select which ones you want to insert into the block. Here’s another tip: you can set how many rows and columns you want your galleries to load at the start. By default, they’re set to automatically display the first couple rows of images so your page can load quickly. If you want to display more, click CHANGE next to your current layout, and you can select how many rows and columns that block will show when the page loads. You can also show visitors a LOAD MORE button when they get to the end that will cause another wave of images to load. Set that up in the LAST ITEM LINK section of the block editor. Once you have your words and images moved over, you can keep going to fill up pages and even create NEW pages! Add a page for a blog! Set up your store! Create forms and add them to pages. You can create as many pages as you want and build pages as long as you want. The world is your oyster. Once everything is good to go you can publish your website! To do this, go to the MENU in the top right of your screen and click DOMAINS. You'll see your active domain and your PhotoBiz 8 site in draft below. Just click EDIT MAIN to make the change, and update your domain to the new site. If you ever get stuck or want some advice, give us a call at 866-463-7620 and we’ll be glad to help. We are standing by to help make your transition as smooth as possible. Don’t have time to build? Our Jumpstart team can build your PhotoBiz 8 site for you! Just pick the template you want, and we'll move your content over in a flash. Let us do the hard work. Jumpstart is just $250! Learn More About PhotoBiz 8! Holly H - Hi Renee! We're making progress with the import function – and we're currently testing it out in the office only. It doesn't always work, but I WAS able to import your site successfully! You can log into your account and make any edits you need using the new system. Renee - So is there going to be a magic import button for the time challenged people to switch from builder to PhotoBiz 8?